Photo courtesy of Planet Ocean Ltd.
ecoSUB, has been successfully trialed in the North Sea off Orkney during a marine robot demonstrator mission coordinated by the National Oceanography Center (NOC). ecoSUB is a new type of Autonomous Underwater Vehicle (AUV) developed by Planet Ocean in partnership with the NOC. The vehicles are around 0.5 meters in length and weigh only 4 kg, and are therefore classified as 'micro-AUVs'. Despite their small size, they are capable of diving to 500 m (2500m for ecoSUB-m25) and have sufficient battery power to stay underwater for several hours. Two of the new ecoSUB-µ5-SVP vehicles were deployed from the Royal Navy's HMS Enterprise during the trial and successfully collected Sound velocity profile data to depths of 100 m. These data will be compared with those collected by traditional 'over-the-side' instruments deployed from the ship, allowing the Royal Navy and the Defense Science and Technology Laboratory (Dstl) to assess the benefits of this new robotic technology. While the subs were deployed and recovered by the RN, initially the vehicles were piloted by our senior software engineer Jérémy Sitbon on board the Enterprise, but following his departure, further deployments were undertaken from Enterprise with piloting done remotely from NOC over the Iridium satellite. Terry Sloane, Managing Director of Planet Ocean, said: "Micro-AUVs are low cost and highly flexible platforms with the potential to transform data collection across the maritime sector. 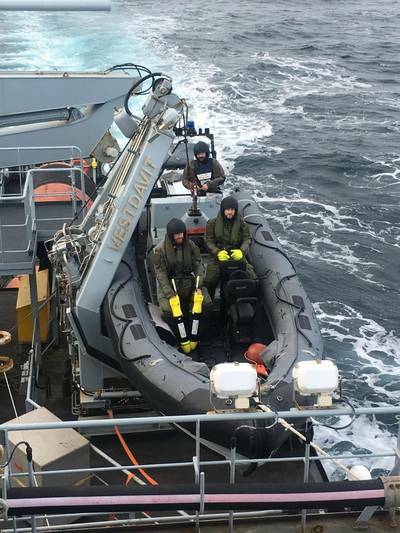 This demonstrator mission provided a fantastic opportunity for us to deploy ecoSUBs from a Royal Navy vessel in challenging conditions, and we are delighted at the quality of data obtained and the ease with which the vehicles were released and recovered."